IMPORTANT: This software is only for use with the products identified and sold in Hong Kong. Not all models are sold in all countries. On the TV remote control, press the "HOME" button to open the TV Home Menu (XMB™). On the remote control, use the arrows to select the Settings icon. Use the arrows to highlight the Product Support icon, and then press the EXECUTE Button on the remote control. Use the arrows to highlight the System Information icon, and then press the EXECUTE Button on the remote control. The software version number will be displayed at the bottom of the System Information screen. If your software version is PKG4.131GHL-0108 or higher, your TV does not need this update. Download the sony_tvupdate_2010_0531_ghl_.zip file to a temporary or download directory (please note this directory for reference) on your computer. Go to the directory where the file was downloaded and verify that the size of the sony_tvupdate_2010_0531_ghl_.zip file is 36,029,348 bytes. a. Right-click the sony_tvupdate_2010_0531_ghl_.zip file, and click "Properties". b.. On the "sony_tvupdate_2010_0531_ghl_.zip Properties" screen, verify that the "Size:" listed is "34.36 MB (36,029,348 bytes)". c. If the file size is different than the "36,029,348 bytes", please download the sony_tvupdate_2010_0531_ghl_.zip file again. Extract the update file from the sony_tvupdate_2010_0531_ghl_.zip file. a. Go to the directory where the file was downloaded and right-click the sony_tvupdate_2010_0531_ghl_.zip file, and then click "Extract All. c. A new folder will be created called "sony_dtv0FA00A00A0A0_00020202"
b. At the "Extraction Wizard" dialog box, click "Next". e. A new folder will be created called "sony_dtv0FA00A00A0A0_00020202"
a. Go to the location where the file was downloaded and double-click the sony_tvupdate_2010_0531_ghl_.zip file. b. A new folder will be created called "sony_dtv0FA00A00A0A0_00020202"
For Windows® XP operating system: Go to the directory where the folder was created, right-click the sony_dtv0FA00A00A0A0_00020202 folder and, from the menu, click "Send To...", and then click the drive (EX: Removable Disk E:) that represents your USB device. The update folder will be copied onto your USB device. For Macintosh® OS X operating system: Drag and drop the sony_dtv0FA00A00A0A0_00020202 folder to the root folder of the USB device. Note: The update will not be performed if the folder structure, name of the folder, or name of the file inside the folder is modified. Note: The software update takes approximately five minutes to complete. During the update process, the screen on your BRAVIA television will display progress information, or may be blank. This is normal. Please do not remove the USB storage device until the update is complete. 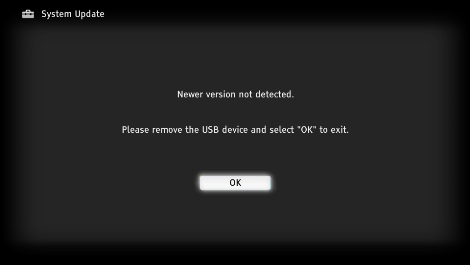 Once the USB storage device has been detected, a message appears indicating that the files are being updated. A series of different messages will appear on the TV set. Please follow the on screen instructions. During the update the POWER indicator will be green for 30 seconds, followed by the PIC OFF/TIMER indicator slowly flashing amber, and the STANDBY indicator is red. 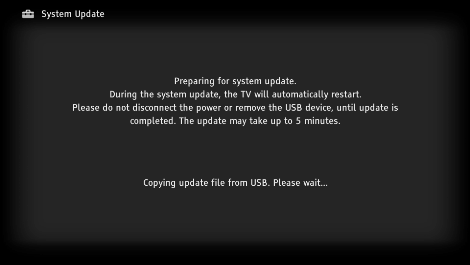 After several minutes, the TV will turn off and then turn back on to complete the update. Please wait until a message appears indicating "The system update is complete." or indicating "Newer version not detected." Remove the USB device from the TV, and then click "OK" by pressing the EXECUTE Button on the remote control. The software version number will be displayed at the bottom of the System Information screen. If your software version is PKG4.131GHL-0108, the update was successful. All user settings will be kept. Either message "An error occurred during the software update" or “Software cannot be updated using this USB device” is displayed on the TV front panel display. 4. "Newer version not detected." is displayed on the TV front panel display. Your TV set already has newer firmware installed.